I wake up in the middle of the night to sketch art quilts into my sketchbook. Ideas just pop up and I can’t stop them… I can absolutely not go to sleep with all of these ideas in my head. I need to sleep and that’s when I relax my brain. I close my eyes and try to fall into coma. Fifty minutes later I give up. I draw a square in the middle of the page and start sketching. It’s fabric ideas. I end up with almost 10 different quilt ideas, prompted by material I know I already have. This is how a project can start. With a big mess of materials that doesn’t look like they will ever come together. Then it evolves from there. A small art quilt, only 12 x 13 centimeter. 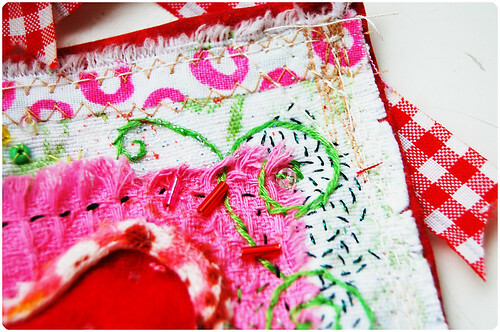 Not counting the tail… A heArt Project married to the art quilt form. And yes, true love. I take off my hat for love. 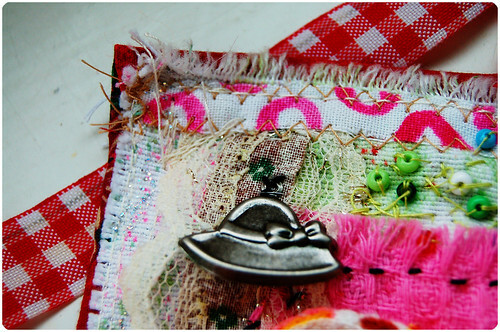 I take my hat of for Love – an art quilt by Hanna Andersson. For sale at Etsy right now. Sold. Thank you! 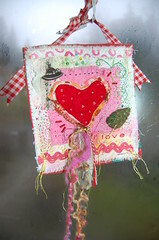 This entry was posted in A Creative Life, Art Experiments, Fabric Art. Bookmark the permalink. 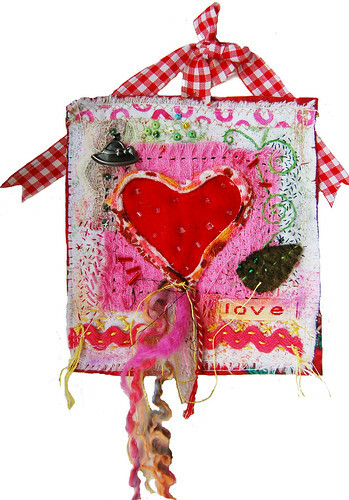 Your art quilt is gorgeous! 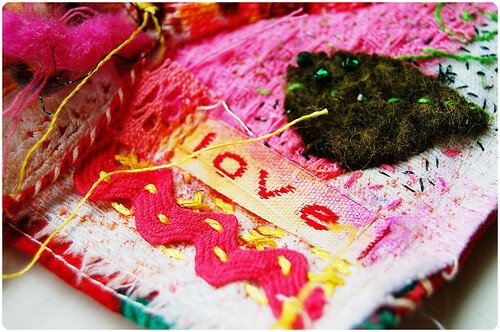 Love the textures, colours..it just oozes love and creativity! I look for your blog with joy and I like your creativ, colourful, happy and poetic products. Best wishes to Miss Smilla from my cat Pauline. This is soooo cute! You make me wanna play with fabrics :) I’ve actually been thinking about it since I bought your beautiful Summer Picture. Oh, So Beautiful! What to do when you can’t sleep. Great idea! Art quilts are one of those things that I LOVE to look at…yours is no exception to the rule! But whenever I sit down to make one…..the magic doesn’t happen. Yours are amazing! Wonderful! I love all the detail in it! I LOVE this art quilt!! I have so much fabric stashed away, but when I try to do something like this, it doesn’t quite “work” for me… you definitely have a gift!! I LOVE your art quilt! I have a huge stash of fabric, and have tried to do things like this, but they never quite “work” out for me… you definitely have a gift for it! !